"They demolished my house on Wednesday and beat me up despite being a blind man and didn't let me take anything out of my house neither did they let anybody take anything out of their house," Mr Black said. "My bungalow was a disabled friendly bungalow which I spent N28 million to build and my properties in that house cost over N6 million." "When Brigadier General Buba Marwa was the military governor of Lagos State, he took over the land for public use and he had apportioned about N2.5 million as compensation to pay to the owners but didn't use the land before he left," said Mr Nzetah. "When Bola Tinubu became governor of Lagos State, the land was given to EIB which is Skye Bank Trustee and the owners went to court to challenge the gift of land to Skye Bank Trustees by government. The matter went before Justice Abiru and some Omo onile went with EIB into a consent judgement with the understanding that N40 million will be paid to the original owners." 'Omo onile' is a popular Yoruba terminology used to describe persons who claim to be original owners of land. "The matter was before Justice Mrs A. A Oyebanji and the Omo onile's won in 2014 with the judgement stating that the land belongs to them," the lawyer said. "The judge said due process was not followed and nullified Skye Bank's Certificate of Ownership and till date Skye Bank did not appeal that judgement. The judge said they did not satisfy the provisions of section 286 of the land use act 1978 and nullified the C of O. The judgment was published in the Guardian when it was delivered." "I bought my land June 2nd 2016, I built my house for three years, nobody disturbed me," said Mr Black. "I moved into my house February 2018 and lived there until June 13 when some people came with hundreds of policemen to the community that they are from Skye Bank, that they are the original owners of this land and they have come to take possession." "We were still in negotiations with them," he said. 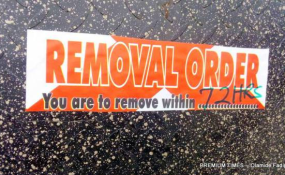 "Our lawyer even wrote them July 3rd and their posture was that we are still on the same page not until they came July 21 when we saw a removal order with notice of 72 hours written with marker. "It was on a Saturday so we couldn't do anything until Monday when we went to the office of the Lagos State land grabbers and we were assured that such demolition was not possible as the notice was not issued by a court and we should relax which we did." "They did not allow anybody to leave the estate, about 50 policemen are at the estate gate, nobody goes out nobody goes (in) and the demolition lasted for four days, over 800 houses. As I speak to you, about six landlords in the estate are dead, one died Monday morning." According to Mr Black, when they marched to Governor Akinwunmi Ambode's office at Alausa to protest the demolition of their homes, they did not get a favourable response. "The senior special adviser to the governor on civic engagement told us that none of us is up to 60 yet so we should go and start all over again because there is no court we will take it to and win. "Where will a blind man like myself start from? Since over a month after the demolition now, I have been struggling to get even a room apartment to put my family but I have been unable to achieve this, we are now living as refugees, hanging around houses of families and friends after the demolition." The chairman of the estate's community development association, Ika Willy, said he had to ask his two daughters to stay behind at their boarding school because they no longer have a home. "My wife and I are living like refugees after the demolition so coming home will add to my problems so I had to force them to spend the holiday in school." Mr Oni added that their position on the matter had been uploaded on the firm's website for the public. The statement on the website reads, "STL Trustees has explained that the July 24 and 25, 2018 execution of the judgment on the property measuring 200.184 hectares situated at Awoyaya Area, along the Lekki-Epe Expressway, Ibeju-Lekki Local Government Area of Lagos State, was in compliance with the Judgments of the Courts obtained in Suit Nos. LD/1911/04 and LD/420LMW/2015." The firm said prior to the demolition, it gave a one month notice to the "trespassers to vacate" the property whilst also giving an opportunity to those who had purchased from some "fraudulent indigenes" to enter into negotiations with its solicitors for ratification and regularization of their purchase. "This notice period regrettably elapsed without STL or its solicitors receiving any offers for regularization from any of the illegal occupants further to which it commenced execution on the said property," the statement added.